A Family Tradition Since 1930! Over time, concrete patios, pool decks, stairs, walkways, foundations, and driveway slabs can settle and sink. To a homeowner, this looks and seems like a major problem. Thankfully, there are cost effective, long-term solutions available right in the Atlanta area. The team at Anglin’s Foundation & Masonry Repairs will perform a comprehensive evaluation of your home’s sinking concrete and determine the root of the problem. Once a plan of action has been agreed upon with the home or business owner, a lightweight polyurethane foam is pumped into small holes in the concrete. Within a matter of minutes, the area is lifted and leveled because of the expansion and flow of polymers contained in the foam. The foam is ultra-lightweight, fills in voids, and will not burden the soil beneath. Holes are patched immediately. The space is immediately ready for walking, driving, and everyday use. There is virtually no mess from grout or required wash down of the area. The material is lightweight and will never lose density. The polymers in the foam are environmentally friendly and contains recycled and renewable materials. Minimal patchwork is needed because the holes that are drilled for the foam are no bigger than a dime. Do you need your concrete lifted and leveled? Don’t let a sinking foundation get you down. Anglin’s Foundation & Masonry Repairs can help. For more than 80 years, we’ve been Atlanta’s trusted foundation experts. Our customers’ needs are our number one priority. We have the resources, know-how, manpower, and experience to resolve any and every type of sinking or settling foundation issue. We are committed to excellence every step of the way. Don’t replace it; repair it. Call us today to schedule a no-obligation consultation. Anglin Foundation Repair is a company with integrity and a name you can trust. 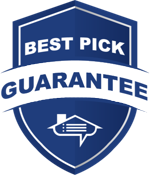 All work is backed by our Price Protection Warranty and John Anglin’s Personal Guarantee. From start to finish, everyone at Anglin's was amazing! Gus was responsive, always answered his phone, knowledgeable, professional, honest and fair. He went above and beyond to make a stressful situation less stressful. Scheduling was a breeze and the crew that arrived on the job (on time, I might add) were courteous, respectful and efficient. They allowed me to watch and take pictures, and explained the process step-by-step, as well as what results were to be expected. Iggy was so knowledgeable, professional and amazing. He was able to pin point a problem that 2 other competing companies couldn't explain or relay in layman's terms what needed to be done and why. He was an absolute superstar in easing the mind of the buyers purchasing the house. His 27 years experience was so valuable. Shelly was quick to send paid invoices and warranty information. Everyone did an amazing job and I would recommend them highly. Today was a install of a 2nd beam for our house... first one was easy, 2nd one gave them a run for their money. But they stuck it out and got it done! Awesome work! I'd throw a + behind my 5 stars if I could. Sorry I held your crew up, but they were determined to get it done with no issues. So shout out to your team Chris, Leo and Dan! The team that lifted our chimney was prompt, courteous and efficient. Other then the repair, you simply could not tell they were even there despite the fact they had to remove part of our deck to do the work. I would HIGHLY recommend them. Diagnosis and estimate from a picture, arrived as scheduled, done in just a couple hours and results were absolutely amazing. Price, workmanship, clean up - everything was absolutely 5 star!! Highly recommend these folks!!! I must add, 2 other well known and much advertised companies came out and estimated 6x the work and price, claiming we had more issues than what was actually going on. These guys call it like it is - honesty and integrity are hard to find in construction. This crew is top notch. Worked with the office and mainly with Gus on site who was great. Showed up early, super knowledgeable, tons of experience. We really felt served in the way he recommended only what needed to be done and at a great price. Had another company wanting to add in other extras and unnecessary work. HIGHLY recommend Anglin!! Quick to call back and totally honest. I wasn't sure if I had a foundation issue or a flooring issue but after a few questions, Nathan helped to figure out that it thankfully wasn't a foundation issue. Insteand of trying to sell me a job, Nathan helped me to make a good decision. I hope I never have foundation issues but if I do, this is the company I'm hiring. Another masonry contractor referred us to Anglin because we had a concern about the structural integrity of our chimneys. We were told that they were the best people to talk to. I called them and they actually came by to assess my house within two hours. Although I was fully prepared to spend a lot of money to stabilize my chimneys, he did a full assessment and very honestly told me that my chimneys were fine and just needed some caulking where the mortar met the brick. I greatly respect his expertise and honesty and would recommend him without reservation. Nathan arrived on time. Explained how they would do the job and gave me a quote on the spot. Chris and crew arrived on schedule and did an excellent job. Their cleanup left my yard looking better than before they came. He went out of his way late in the evening to help me in preparing an estimate for repairs on a house that my wife and I are purchasing! Very helpful and knowledgeable about our future home repair needs. Anglin's crew was efficient, courteous and cleaned up very well. The repair was done in a day, the cost was less than expected and my questions - before, during and after were answered and well-explained. The foreman, Iggy, knows his onions, for sure! This is onkly one to call! I needed foundation work on my porch and did a lot of research about companies in this field. It didn't take long to realize there are many companies who claim they can do the job but then result in failures and disappointed customers. Since often the problem of foundations is difficult to truly assess up front and know if the jacks or expansion materials will be able to raise a sinking area, you can't get any guarantee from the companies that they can raise a sunken structure back to its original state. They only guarantee to stabilize it at its current level. So once they begin the process, if their solution does not work, you may be paying for no visual improvement. That's real unsettling when you're talking about thousands of dollars with no guarantee it'll look better or even be brought back to building code height standards. The other thing I learned is often most companies quotes don't include the finish masonry work that is usually necessary to finish the cosmetics of the job. After talking with several firms I chose Anglin's based on good reviews and a good gut feel after meeting with their sales guy Gus. He did a good job of explaining things and even came out twice to go over the job. Frankly, their quote was 20% more than another large competitor, but I felt justified because it included the masonry work. End result, the crew led by Iggy showed up bright and early on schedule and did an outstanding job. They are very customer-centric and truly wanted to satisfy us and permanently fix the problem. Most admirable is the fact that, indeed one of my problems was not curable using their standard approach and without hesitation Iggy moved to another approach that cost them quite a bit more time to complete. I'm very satisfied and would highly recommend them to others. Anglin's just completed a job at my house which involved jacking and bracing floor joists to level the kitchen floor as well as an outside hydraulic jack to lift the corner of the garage wall back into place. Anglin's rep (Nathan) came out to review and scope the job, and came back a second time to answer questions that came up once I got the drop ceiling in the basement out of the way. The crew (Chris, Jose and Leo) were all excellent. Hard workers, did the job in a workman like manner, made adjustments as we found other issues, installed a beam to reinforce the floor beneath the washer and dryer room and adjacent stairway, added another small brace on a cracked joist that was not part of the original scope for free, and cleaned up very well afterwards. Overall, a very good job. I was very pleased with the work and the crew and would not hesitate to use then again or recommend them to others. Having my freestanding all brick garage had some serious sagging at the two front corners and there were issues with the doors closing right and some serious cracks in the mortar joints. One was about an inch wide! Getting the slab jacked up and cracks in the brick repaired was a little intimidating, but Anglin made it a great experience from beginning to end. Nathan, the inspector and estimator was on time and professional and did a good job of explaining the possible options for repair. I chose the steel pier system as it is a more permanent solution for my garage. A week later, when it came to to do the job, the work crew, Chris, Wes and Leo were actually a few minutes early, which, considering how far they had to drive with Atlanta metro traffic was pretty impressive. They were courteous and professional and took the time to answer my many questions throughout the process. Even though it began to rain about an hour before they were finished, they kept on working and cleaning up. My all brick free standing garage looks great now! This company is top notch. They reply to estimate requests speedily, They accommodate rush jobs, And their crews are responsive to customers concerns and needs. 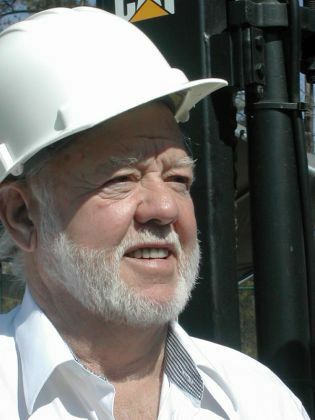 The very best in advice, his experience and skill of estimator Gus C. was so helpful. You can trust this company. I did. And I'm glad. Very positive experience. Called day before to confirm appointment. Showed up on time and finished job in one day. Iggy and his crew were very professional, kept me informed throughout the day and did an excellent job of repairing my brick porch and a brick retaining wall. Would highly recommend. Anglin's estimate for our front porch repair was slightly higher than others we obtained, but the other two did not include the needed masonry work after the piers were installed. That, as well as other positive reviews, was our primary reason for selecting Anglin's and we feel we made the right decision. Iggy and his crew arrived early in the morning and completed the repair early in the afternoon. He was very responsive to our questions as the work proceeded. I highly recommend this company for this type repair to anyone. Excellent job done on my foundation repair. Also, the company that advertises a lot on radio quoted 2.5 times higher than Anglin's. Since encapsulating our crawlspace about two years ago we noticed some uneven areas in our floor. I contacted Anglin's for an inspection and quote. From the first, my experience was very positive. Jill, who answered the phone, was cheerful, friendly and professional. When Gus came out to inspect our home, he arrived on time and was knowledgeable, courteous, and professional. Gus spent about an hour and a half carefully inspecting our home. First, he listened to information about the history of our home and our concerns about changes we were noticing. Next, he checked the inside for any signs of cracking or other evidence of shifts in the foundation. After that, he took measurements throughout the first floor of our home to determine precisely the amount of unevenness, if any, existed in the level of the floor. Finally, he spent a good deal of time in our 4 foot high crawl space carefully inspecting the foundation, support beams, floor joists, sub-flooring, etc. Throughout this time, Gus patiently and thoroughly answered all of my questions. Ultimately, he recommended that we not do any structural repairs at this time. He said if it were his home, he would take pictures of the minor cracks in the walls, repair them, then keep an eye on them to see if they reappeared. If they did, he said he would be happy to come back out or, if I felt more comfortable, I could hire a structural engineer to assess the issue and make recommendations. Although he could have recommended repairs which would have benefitted his company, he did not. I am impressed with his knowledge, thoroughness, professionalism and integrity. If we do need foundation work in the future, I will call Anglin's. Competitive pricing. Great service. Was given one quote over the phone after I emailed pictures, and given an even better quote on-site when they came to survey the job. Quality all around! Anglin's was great to work with. They were very professional and pleasant. Gus was easy to work with and always answered me back immediately. They were very fast, efficient and cost effective. Excellent job and well done. Everything was explained clearly. A special thank you to Iggy, Don and Santos. They are the best. 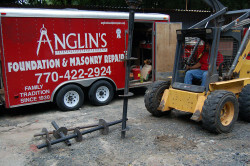 I recommend Anglin's Foundation and Masonry Repairs to anyone that needs their services. Everything from my initial quote from Guss to my tech Keith was completely professional. Keith and his assistant took great care to do the job right and make sure our livingroom was back to level. The price was right and the service was great. Thanks Anglins! Recently had some foundation work completed by Anglin's. The process started with Nathan carefully explaining to us what our problem was & what had to be done to correct it. No pressure. No highest price 1st then lower price later. Just the price (very fair) & what had to be done. The work was done 2 weeks later by Chris & Mitch. Same result. Carefully explained what they were going to do to fix my problem and then did just that. With Anglin's price guarantee the quoted price was also the final price. Very happy with the price, the work and the professionalism of everyone. Thank all of you very much. If you want a quality job for less than the other "major players" in the foundation repair business, Anglin's is a great choice. Everyone we dealt with at the company was very helpful and courteous. The workers who did the job were both friendly and competent; the work was completed very quickly. Our repair included the installation of 9 piers and mortar work on some major cracks that had opened on our porch, in the brick and in our foundation block. We had an item on our property that was accidentally damaged while our foundation was being repaired. The company was very good to make compensation without any hassle. We highly recommend them. Great Company!! Great People!! Professional!! Efficient!! Would Highly recommend them!!! As a Realtor for over 30 years in Atlanta I personally couldn't be more impressed with Anglin's. I called them to request an estimate for a sagging great room addition. They responded promptly and sent me a proposal via e-mail. I was pleasantly surprised to learn that the cost to raise AND support the failing iron post and footing was much lower than I had anticipated. Several experienced workers rolled a large piece of equipment into my back yard which actually "lifted" the sagging corner. I couldn't believe my eyes. They then ran steel rods far below the ground to secure the support post and footing. Job well done and no issues since. I would not hesitate in my recommendation of Anglin's. I only wish more local business were as fair, professional and honest. We had settling issues with our bay window and wrap around porch. We had a total of 5 companies come out to take a look and let us know what needed to be done to resolve the problems. It became clear to us that Anglin's was the ONLY company that really understood the root cause of the issues and how to provide a permanent fix. Three companies only wanted to address the issues cosmetically, two offered, "...we could try this..." solutions! Nathan came out to inspect and give the estimate and clearly explained where the weak spots were, how they caused the cracking and settling, where the piers would be placed, etc. Iggy and his crew came to do the repairs and were very professional. Iggy took the time to point out several areas where the footings were lacking and how they were going to address that. We had 5 piers installed. After they stabilized everything, they did all the masonry repairs (the cosmetics) and it all looks beautiful. We are very confident that Anglin's solved the issues and restored the bay window and porch to A-1 condition. Anglin's also stands behind their work with a lifetime warranty on the bay window and 10 year warranty on the porch. I believe of the other four companies that would provide a warranty, the max was one year. We were greatly relieved to find Anglin's - when we first discovered the sagging brick arch under the porch we had no idea what we were in for and it was a little daunting. We are confident that these issues are behind us now. Anglin's did a fantastic job for me, exceeding my expectations. Gus was very thorough in analyzing several foundation issues and incredibly patient in answering my many questions. The crew was friendly, courteous and clean. I can't say enough good things about Anglin's and highly recommend them! Representatives were very professional and courteous. They explained the process completely and worked very efficiently. Couldn't even tell they were there. Outstanding service and would highly recommend. The crew called the night before and morning of the job to make sure I knew they'd be coming and when to expect them. All companies should do this. They got straight to work in the blazing heat. Our front brick stoop and stairs got supported, welded up our metal railing, fixed a bunch of mortar work and left everything neat and clean. Thank you! I moved into a house that was built in the 1970's. My initial call was for the front porch which was sinking when I moved in. I called Anglin's, and was able to get an appointment that week with their estimator. While at the house, Gus gave me an inspection of the rest of my house and found that one side of the house was also sinking. I was very satisfied with the work done; the time schedule for the work; and their personnel from beginning to completion of the job. I would highly recommend Anglin's Foundation to anyone I know. Very pleased with work. Garden wall 6-7 feet high started to fall. Braced with piers after straightening; all cracks beautifully mortared and repaired. Did the entire job for the price they promised. Very satisfied. We reached out to them about our sagging lentil on a Thursday, they came out late that same afternoon, got a written quote the following Monday and they completed the job on Wednesday that same week (they could have done it on Tuesday, but we weren't ready!) Very friendly, professional and courteous! Nathan and Chris kept us informed of the process and what to except! Great job and I highly recommend them! My experience with Anglins was nothing but positive. We had a home repair required to sell our home. They were prompt with responding to a request for a quote. Their quote was by far the best price. We went with them and the process was easy. Everything was done the same day as opposed to the 3-4 weeks quoted by competitors. Over all we were very pleased with the work and with our experience with Anglins. They will be our first point of contact on future projects. Great team of guys. Came out in the freezing cold and knocked the job out. Even helped me out with an existing french drain by digging it with their machine which saved me days of back breaking labor. Friendly and professional. Highly recommend them. Excellent and fast repairs. They explained everything in details about the entire process and the repairs. end results look great. We would highly recommend Anglin's service. They explain very well the work that needs to be done, and complete the job on a timely basis. Professional people that do what they say they are going to do and they clean up well! Anglin's straightened out my leaning chimney and fixed my sagging garage and front steps - all in a single day. Timely, courteous and professional. I highly recommend them. 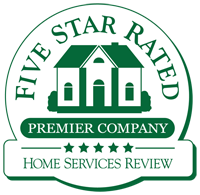 It is very rarely I take the time to write a review, however, when you spend a lot of money on something serious like foundation repair and you deal with a professional company that went above and beyond, I feel it is strongly warranted. 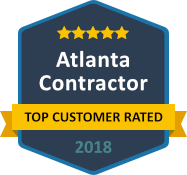 In summary, don't worry about going anywhere else if you live in the Atlanta area for foundation/masonry work or concerns - I am telling you, Anglin's is the best; I can't speak highly enough about them. From start, to months beyond the job, these guys redefine customer satisfaction. I give them my highest marks - "Good people." Everything from the estimators working with you(Gus you are the best), to the hardworking and very experienced workers who took care of us (Iggy et al), to Bill and Jill in the office who handled transferring the warranty for the work when we sold our home and all the stress that can go with that - Anglin's has it right. Other companies didn't even come close. Some would not even show up for an inspection. Other (big names I won't mention) companies wouldn't send their estimates like they said they would. These guys came out, on time - every time. They charged rates that beat most of the competition, but they did so with great work; I know, I watched them the entire time. They fixed little things that weren't even included in the price, just because they had the free time on the job and the extra materials were already there. You just don't find people like that anymore. I wanted to write this review because good people deserve good things. I hope Anglin's gets more business, that is how much they impressed me. Thanks Mr. Anglin et al for the hard work and for a great company. To people who may stumble on this review, I hope it helps, rest easy...Anglin's is where you want to end up. My house is over 30 years old and someone added a 2nd story sunroom supported by steel posts about 25 years ago. In the last 10 years, it settled 1/2 inch on 2 sides. The windows wouldn't open and I was worried about continuing settlement. I called 4 companies and Anglin's was my last call. The first, Champion, builds sunrooms. They sent out a rep but he said they don't do repairs, only build and he recommended a foundation repair com[any. The 2nd had a phone listed in Atlanta and in another part of the state. The Atlanta number was disconnected and the guy that answered the other number said that he would do the work in wood but not steel. The third contact, Trotter Company, quoted me three times the cost of what Anglin's charged me. They were knowledgeable, courteous, and professional and I had every confidence that they would have done an excellent job. Problem was, they were proposing sinking helical piers 20 feet into the ground, pouring new footings on that, and then installing new steel posts. This solution just struck me as over-engineered and over priced. My last call was to Anglin's. They promptly returned my call, and were knowledgeable and courteous, and professional. The man that came out and wrote the proposal told me that he could look at it and didn't even require me to take time off of work to be there. He called me back the next day with the proposal. They proposed to sink rebar into the ground and poor larger, higher footings. He even saved me money by utilizing the existing steel posts which were in great condition at the point at which they cut them off. Anglin's work crew was knowledgeable, professional, and courteous as well. They communicated well and worked diligently while on site. When they came in to check level with a 6-foot level, it was dead-on level in every direction. These guys were done in 2 days and cleaned everything up and they did it for 1/3 of what I was quoted by the guys that advertise all over the radio. I am 100% satisfied with Anglin's and would recommend them to anyone. If I ran a foundation repair company, this is exactly how I would do it!!! I've run corporate purchasing departments, so when I buy any product or service over $1k, I get at least 3 bids. I actually met with 4 foundation contractors to bid on stabilizing three spots on my home foundation that were causing cracks in the brick. Here's what I discovered . . . Although every one of them quotes differently in how they break down the quote - the bottom line was almost identical - within a few dollars. This is a highly competitive industry and the cost of this work has become a commodity. So why - out of 4 bids did I chose Anglins. Simple - they were the ONLY really full service firm out there. Three of the others said they couldn't fix the brickwork after they stabalized the foundation - I would have to find another contractor for that. Two of the others wouldn't put my landscaping and hardscaping back - I would have to have my landscape company come back and do that. John Anglin said "Here's my price, we'll fix the brick, and when we're done you won't know we were here and you won't be able to tell your foundation ever had a problem. And he was right. Anglin's also didn't use any FUD (Fear, Uncertainty and Doubt) in their sales technique. They didn't badmouth the competition, they didn't try to oversell me or scare me into buying more than I needed. They just gave me a fair quote and great job. The crew was amazingly efficient - these guys have worked together for so long they move like a well oiled machine. They put 6 push piers under the foundation in less than a day, fixed the brick, put everything back and cleaned up. Excellent work - I highly recommend them. these are the guys to use. they were here when scheduled, did their work in one day, cleaned up well. the repair was for my house which had starting tilding. I could not recommend them more strongly. they know their craft and their experience was invaluable. Anglin's did a job ay my house that involved jacking and bracing floor joists to level them, a hydraulic jacking job to raise the garage corner wall back into place, installed a beam to reinforce the floor beneath the washer and dryer and adjacent stairway, added a small brace on a cracked beam that was not part of the original scope for free, and cleaned up very well afterwards. The crew came on time, set to work immediately, were very polite and informative, did the job in a workman like manner, and finished up earlier than expected. Overall, I was very happy with their work and would readily hire them again and recommend them to others. What a great company! These guys did a fantastic job fixing our very bad patio problem!! It was done quickly and the workmanship was amazing. Highly recommend them!! Very professional and really know their stuff. They had no problem working on the settling foundation of our 150+ year old house. It took a little more work than what was originally quoted but the cost didn't go up at all. Excellent customer service and quality repairs!!!! I highly recommend Anglin's Foundation & Masonry Repairs. They just installed two supportive piers under our slab due to soil settling, and they repaired the corresponding cracks in the brick masonry. Even within hours after the work was complete, we could hardly tell where they had repaired the masonry. From start to finish, the staff displayed courtesy, professionalism, and a no-nonsense, hard-work ethic. Gus, Chris, Keith, and Mitch were all a pleasure to work with. We are doubly re-assured about their work by the lifetime guarantee their work carries. We were worried sick about the condition of our slab and masonry, but now we feel very confident that the most important feature of our home is soundly secured. Great service. Knowing that this was definitely not something I saw coming in my budget, Gus figured out the least expensive (but still totally effective) way to fix my foundation problem. He explained everything well. The crew came out the very next day and did a great job of fixing the foundation and repairing the cracks in the brick. They were very reassuring that this would be the end of my problem and that is a good feeling to have.